The lymphatic system works with the circulatory system to deliver nutrients, oxygen, and hormones from the blood to the cells that make up the tissues of the body. Where ever you find blood vessels, you will find lymph vessels (they are joined together with a network of capillaries). The Lymphatic System is a part of our Immune System. It produces the antibodies which defend the body against disease causing agents such as viruses, bacteria, or fungi. Its job is to fight off infection and to keep the infection from spreading throughout the body. The Lymphatic System also balances the fluids in the body tissues. Lymphatic fluid is a clear watery fluid. One of its jobs is to cleanse and recycle fluid from the blood and body (interstitial fluid), filtering out bacteria, dead tissue, damaged cells, and foreign matter. Waste is filtered so that the lymph can be safely returned to the circulatory system. Our bodies hold three times more lymphatic fluid than blood, yet, unlike the blood, it does not have an automatic pump (the heart). We have a “manual” pump for this system of the body. 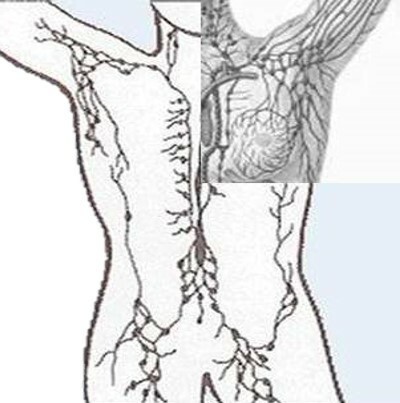 The lymphatic system relies on the contraction of muscles to move lymph throughout the body. Exercise creates rhythmic contractions to pump the lymph’s. Deep Breathing uses the lungs to act as pumps for the lymph’s. Stimulate your lymphatic system with Ginger Baths and Lymphatic Drainage Massage. Tension and stress will greatly impede the flow of blood (remember the illustration of the “tight fist”). Ginger baths help the body to relax and reverse this condition of tension. This can be very helpful for those whose Lymphatic systems tend to be slugging (genetic disposition). A very important function of the Lymphatic System is the elimination of waste by-products. Not only does this system assist in the elimination of toxins from the foods we eat, the air we breathe, nerve toxins created by unhealthy emotions (more about this to come! ), and a myriad of other toxins… it must also eliminate the waste from the trillions of cells that make up the human body. To add to this monumental task, we will learn that the human body also has 100 Trillion bacteria (good and bad) and every one of those bacteria are adding to the waste load that must be eliminated. Whew! That’s a big job. Each body system relies on all others for optimal health.